Every single time you hear someone from the political right trying to make out that Jeremy Corbyn is some kind of hard-left economic extremist (as if the Tories are economic moderates in comparison), you've got to remember that they're trying to convince you that black is white. In reality Labour's core economic policies under Jeremy Corbyn's leadership (public ownership of the rail industry, water companies, mail service, health service, police services & national grid + a National Investment Bank) are quite normal centre-left policies that are commonplace across the developed world. Not only are these policies commonplace across the developed world, they're all incredibly popular with the public. 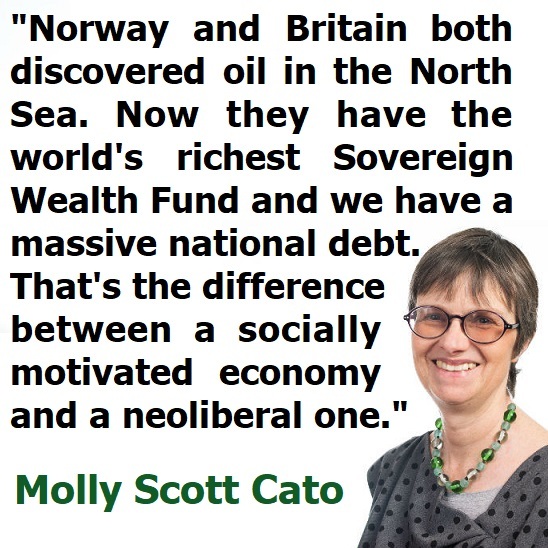 Renationalisation of our core infrastructure and services has overwhelming public support, and the only reason British people are a bit more divided over the excellent idea of a National Investment Bank is that Britain has never had a proper sovereign wealth fund like Norway, so a lot of people are unfamiliar with the idea. There is a constant right-wing political narrative that Jeremy Corbyn is a terrifying hard-left economic extremist which rarely ever gets challenged by the mainstream media. 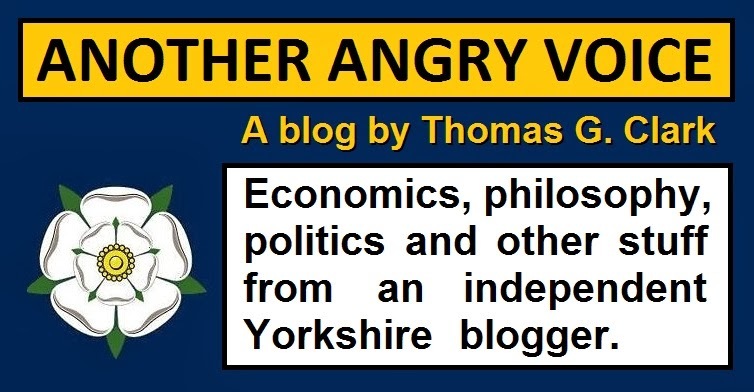 But the really crazy thing is that while mainstream media hacks continually allow right-wingers to smear Jeremy Corbyn and Labour as economic extremists when they're not, they're simultaneously letting the Tories get away with implementing one crackpot economic policy from the hard-right fringe after another. Only 3% of the British public agree with the proposition that police services should be privatised, yet that's exactly what the Tories have been up to. In 2012 they ignored expert opinion and public opinion alike and privatised the Police Forensic Science Service. Now that police privatisation policy has come back to haunt us all as one of the privatised forensic science companies has been caught manipulating the results of 10,000 samples from criminal cases. That's thousands of potential miscarriages of justice! Thousands of potential retrials (at the taxpayers' expense of course). Potentially thousands of innocent people fined, or even jailed for crimes they didn't commit. And most worrying of all, these manipulated samples could have allowed rapists, murderers and violent criminals to roam free as innocent people took the rap for their crimes. Then there's schools. Only 6% of the public believe that schools should be privatised, yet that's exactly what the Tories have been doing since 2010. Over the last seven years they've transferred ownership of literally thousands of state schools to shady unaccountable private sector psuedo-charities that have then used bloated executive salaries in order to siphon millions out of our children's education budgets and into their own pockets. The mainstream media completely let them off the hook for implementing this fanatically right-wing policy. It's incredibly rare to see the mainstream journalists frame the situation as hard-right radicalism gone wrong whenever a privatised academy chain collapses into ruins, but that's exactly what it is because hardly anyone wanted our schools privatised in the first place. Then there's the NHS. 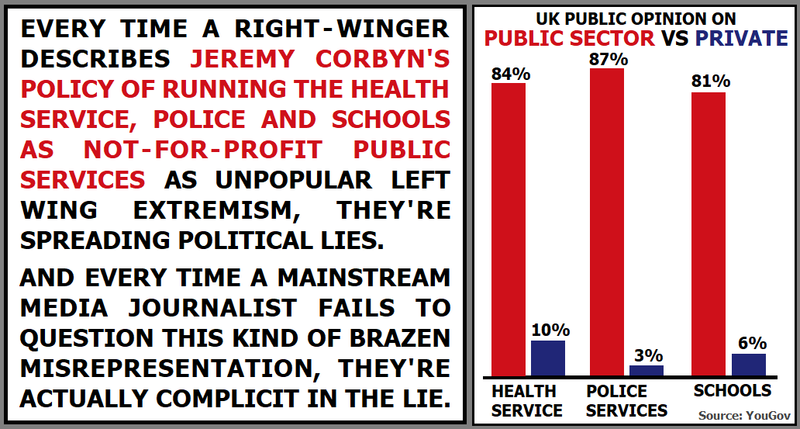 The public is split 84% to 10% in favour of running the NHS as a not-for-profit public service (which is Jeremy Corbyn's position), yet the Tories have been carving it up and giving away the pieces to their private sector mates ever since their disastrous 2012 Health and Social Care Act. The more they cut NHS funding and distribute services to their private sector mates, the worse NHS services are getting (just ask anyone who actually works in the NHS), but the mainstream media barely ever frame the worsening conditions in the NHS as yet another example of hard-right Tory radicalism gone wrong, because they're too busy trying to frame Jeremy Corbyn as the terrifying extremist for actually offering the public what the overwhelming majority of them say they want! If Jeremy Corbyn was on about nationalising the airlines there would be legitimate grounds for claiming he's an economic extremist given that only 14% of the public support the idea, while 68% oppose it, but he's certainly not proposing that. 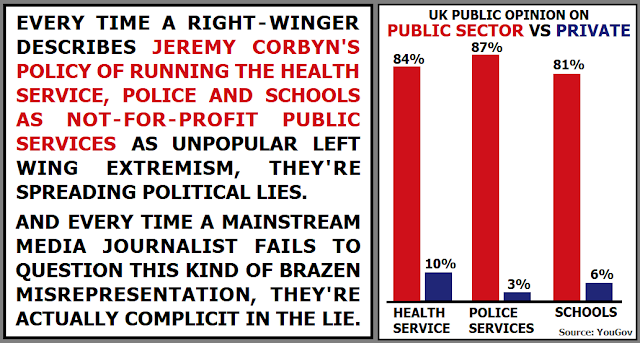 And even if he was proposing a more radical left-wing policy like that, it's still not quite as extremist or unpopular as the Tory policies of privatising police services (87% against - 3% in favour), the NHS (84% against - 10% in favour) and schools (81% against - 6% in favour). So the next time you hear a right-winger trying to deride Jeremy Corbyn as an economic extremist, you've got to realise that they're taking you for an idiot and trying to con you into believing that black is white. And whenever you see someone from the mainstream media refusing to hold the right-winger to account over this kind of Orwellian deception, remember that they're making themselves absolutely complicit in the con.